Brood X is the largest (by geographic extent) brood of 17- year cicadas. 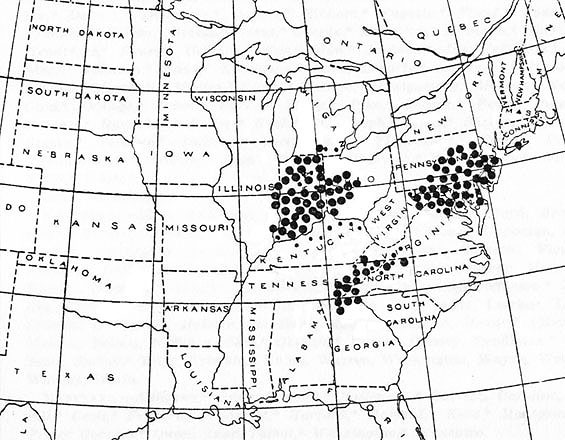 Populations historically recorded from KY may be off-cycle emergences of Brood XIV (see: Lloyd and White 1976). Brood X has also been reported from MO; however, current opinion on these records is that they date from a co-emergence of XIX and X, and that they were mistakenly attributed to X. For a discussion of Brood X in MO, see: Marshall 2001). MI populations are generally only M. septendecim; however, M. cassini has been recorded in the state (Marshall et al. 1996). Marshall, D. C. 2001. Periodical cicada (Homoptera : Cicadidae) life-cycle variations, the historical emergence record, and the geographic stability of brood distributions. Annals Of The Entomological Society Of America 94:386-399. Marshall, D. C., J. R. Cooley, R. D. Alexander, and T. E. Moore. 1996. New records of Michigan Cicadidae (Homoptera), with notes on the use of songs to monitor range changes. Great Lakes Entomologist 29:165-169.